The water was murky yesterday and we couldn’t see a whole whale shark all at once. Here’s a photo, downloaded from the internet, that shows the relative size of a whale shark. Copyright Alamy. 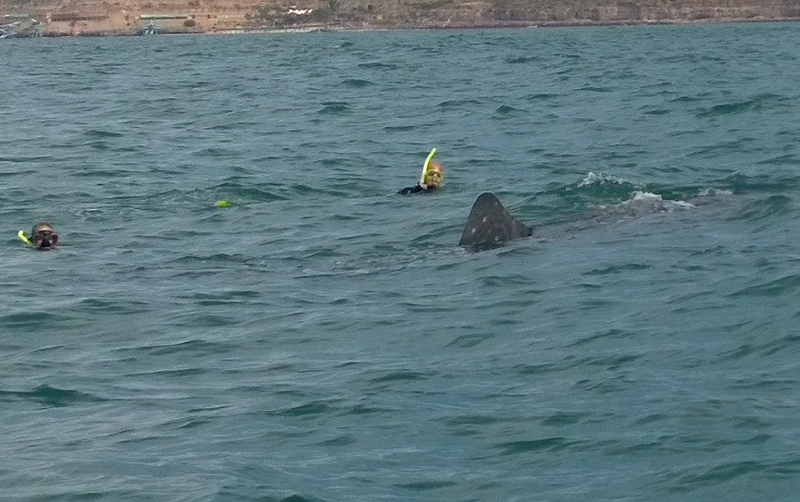 Yesterday – wow, wow, wow – Baja Expeditions took us snorkelling with whale sharks. Approximately six of them, we think. 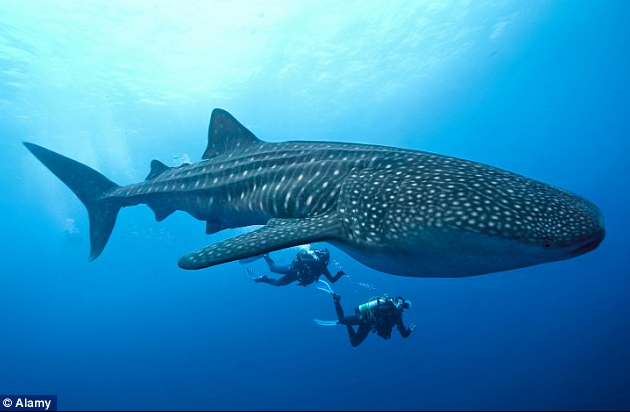 Whale sharks are huuuuuuge – so huge that there’s no other fish that’s bigger. 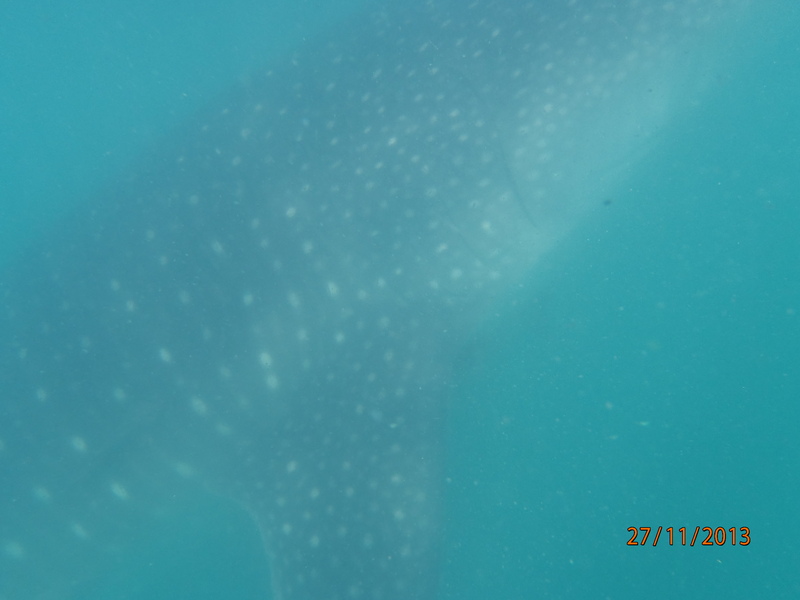 The longest one ever recorded was 13.5 metres, but the largest that we saw today was a mere 7 metre juvenile. Underwater, and only two feet away, 7 metres may as well have been 7 miles. These things were massive, enormous, gigantic. They rival some of the largest dinosaurs in weight, and after 60 million years they’ve been around for almost as long as the dinosaurs too. We were asked to stay at least two feet away from the creatures and five feet from their tails (tricky – they move underwater faster and more easily than we do, and often straight towards us) and not to touch them (also tricky, for the same reason). Swimming with such vast fish was an intimidating experience; when you share space with something that large (and no bars between it and you), it really shows you your puny scale in the world. Despite being the largest fish in the sea, they feed on the smallest creatures in the sea: zooplankton. Oversized humans don’t feature on a whale shark’s menu and that’s fortunate because their mouths can stretch up to five feet wide! (There is a story of a diver nearly being sucked (accidentally) into a whale shark’s mouth, but he escaped unharmed.) They feed by opening their mouths and ramming into shoals of plankton, then draining the water out of their gills. Filters inside their mouths separate food from water. They have teeth too, but no scientist has yet figured out what for. Whale sharks are kept in aquaria in Japan, China and Atlanta. The thought of keeping these gentle giants in captivity makes me feel sick, but it was an honour to share their natural habitat with them yesterday. It was an amazing encounter, and the fabulous day was topped off by the sight of mobula rays and a small school of dolphins playing around our boat on the way back to shore. 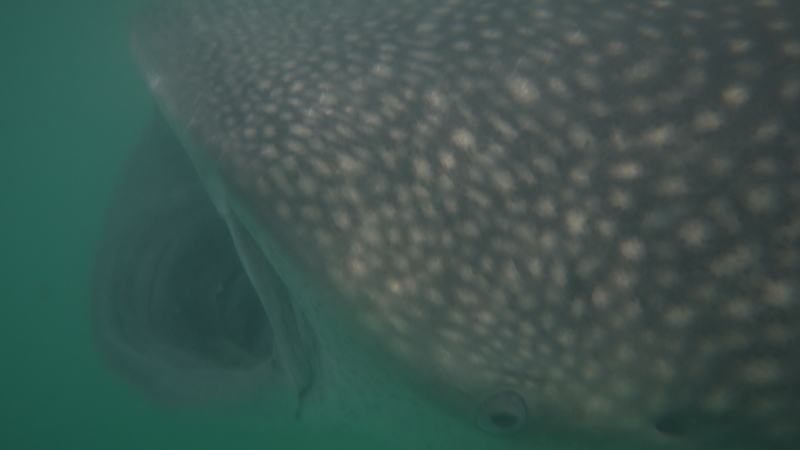 Ian took this amazing picture of a whale shark’s head. We were really quite close! Max took this photo (with his birthday present camera) of a shark’s pectoral fin.